Foxconn will not only manufacture every second-generation, 5.8-inch OLED iPhone — sometimes dubbed the "iPhone XS" — but 90 percent of 6.5-inch "XS Plus" units, and 75 percent of a 6.1-inch LCD budget model, according to one research firm. Pegatron will handle all of the remaining orders, said Fubon Securities, which would quash rumors of Wistron's involvement. Pegatron is a long-time Apple partner usually relegated to second-tier status on iPhone assembly, though it can sometimes have a more prominent role with other Apple products. In any case Apple has certified all of its major component suppliers for this fall's iPhones, Taiwan's Economic Daily News claimed on Monday. Those suppliers have reportedly been shipping parts en masse. 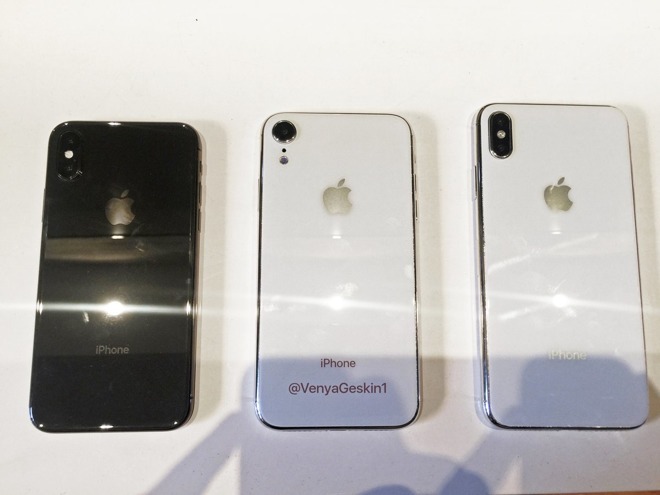 Indeed the companies have likely been shipping out parts for a month or more if Apple intends to roll out new iPhones this September, as usual. Final assembly typically begins at least a month before iPhones ship, and often more in order to ensure enough launch inventory. Even with months of preparation, launch-day stocks can evaporate within hours. Apple is probably eager to avoid a repeat of last year's release. The iPhone X shipped in early November, well over a month after the iPhone 8 and 8 Plus, with the blame largely aimed at manufacturing issues with the iPhone X's TrueDepth camera, which has tight tolerances and supposedly created production bottlenecks. All three of this year's iPhones should have TrueDepth technology, as well as edge-to-edge displays. The 6.1-inch model would be Apple's first LCD product with such screen technology, and also offers up production challenges that do not affect the OLED versions.